Price: $79.00 Retail, $36.33 Amazon. Being an avid photographer is a double-edged sword. People love to look at and discuss my pictures, ask why I took certain shots and laugh at my purely artistic renderings. The other half, my subjects, often wonder if I have anything better to do with my time or my cameras. I do but I love photography, so we all must bear the curse of my hobby. 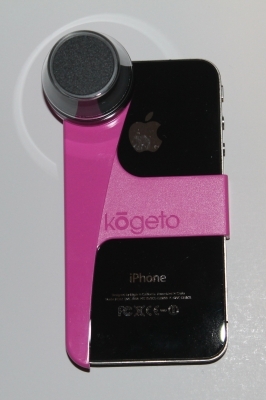 When I received the Kogeto Dot for review, my family scattered into every possible direction knowing that they’d be filmed in wonderful 360-degree awesomeness. 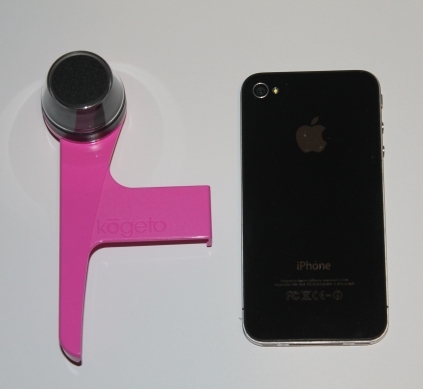 For review, I received the Kogeto Dot “Breast Cancer Awareness” version in bright pink, which is hard to miss, especially when I’m carrying it around. Everyone looks in wonder. At least once every time I attach it to my phone, someone asks me about it and wants to see it work. I took it to the Tulsa State Fair and walked past The Side Show to give it a test. You can see that everyone nearby looked on as if I had on clown makeup (I didn’t). 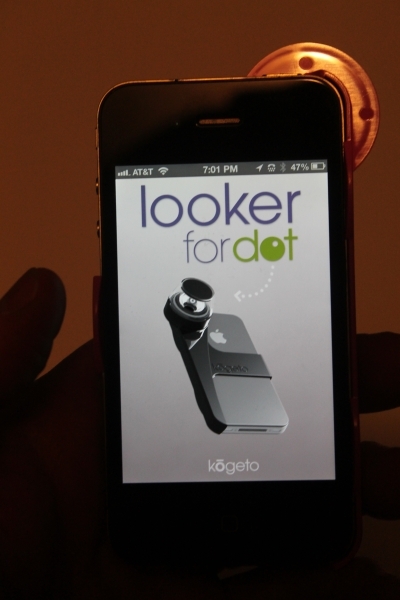 The Dot is a very fun gadget to use. I love it. It’s lightweight (0.5 ounce) and, if you get the black one, hardly anyone would notice it. The cool thing about it is that it comes with its very own app, Looker. Of course, the app is free and works very well with the camera lens. The only things you have to get used to are: 1) You have to hold it face up (lens down) with the phone flat and 2) You have to trust the app, not your eyes. If you look at the app picture, you can’t tell what you’re looking at because you basically get a donut shaped viewer that looks very distorted. Don’t look at it. 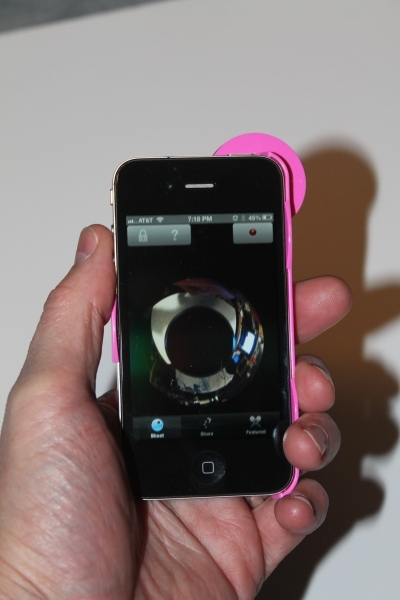 Open the Looker app, press record, hold the phone high over your head with the lens down. When you upload the video to the Kogeto page, click the Flip button to turn your video right side up. The reason you have to hold it with the lens down is because of glare from light sources, such as overhead lights, the sun and any light that’s brighter than your surroundings. When you watch your videos, you can actually pan the video while you’re watching them. Live panning. It’s so cool. I just can’t enough good about this little gadget. 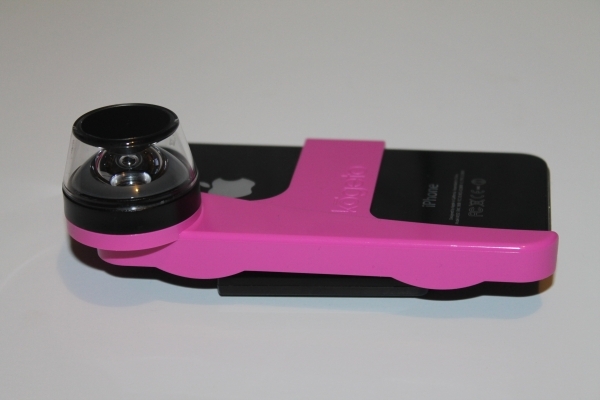 It’s fun, it’s inexpensive and it’s a cool addition to any iPhoneographer’s bag. You gotta have it. I give this product a rare and perfect 10/10.